Week ago we published the first version of "Notify Mi Band" and it seems to go pretty well, right? In the coming update, we improved several things both on the technical level and UI. Improved activation scenario. Now you won't need to close "Bind Mi Band" when you activate the app. But you might still need this when you open "Notify Mi Band" next time. Enhanced support for some apps, which didn't have a correct name displayed (it showed a path like "C:\Programs\.."). You still might see something weird in the app name, so contact us if that happens. Additional information support. We added "help" page that should provide answers to the "most hot" questions regarding the app. "Bind Mi Band" also receives a small but recommended update 1.18.2. Why don't incoming calls notifications work? This feature is still not supported by Windows API. Please, be sure that we will implement it when there will be such possibility. I cannot see my applications in the list. Application appears when a notification arrives. We can't access the full list of applications ahead of time. I see a Bluetooth error on the main screen. Make sure to close other apps that use Bluetooth while using this one, including Bind Mi Band. After you configure your notifications, you can safely close Notify Mi Band. Notifications will arrive in the background. Why is my OS version not supported? You need to have at least Windows 10 1607 (Anniversary Update). Only after this update necessary features become available. Some of the applications are not displayed correctly. Please, contact us by email, so we can fix that. Why is it a separate app from "Bind Mi Band"? It's a risky thing, so we decided to give it a separate go. Also, we will need to have separate WP8.1 and WM10 versions of "BMB" and it's a big piece of work. So now we could release the feature faster. Nice to see development carrying on apace. Keep up the good work. The next step may would be add synchronization to google fit or/and microsoft band app. This would be a very important impulse for this app. I use at now myfitnesspal, mi band notify and strava all synchronized by google fit. If you could develop the synchronize with a hub, me (and more people that I) dosn´t need anymore else a old android terminal to use for fitness. +1 from me on the google fit integration. Why telegram notifications don't work? We need integrated firmware update to stay up to date. Majority of us have windows phone, not iOS or Android for firmware upgrade. Think about it, plz. yes, that what we waiting, but my workaround for this problem for firmware upgrades i purchased crappy android phone with BT v4.0 for $43 only. Both applications are getting better, congratulations! 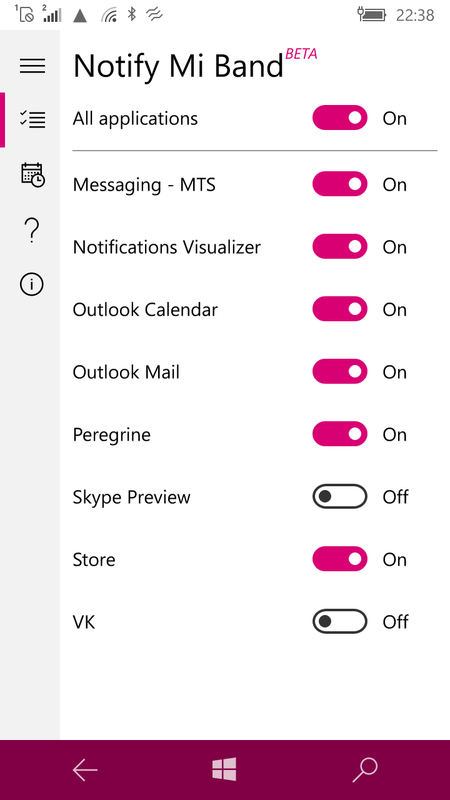 The only thing that I wish now is that the "Notify Mi Band" to display the icons of the respactivos applications and notify you during a call. Anyone else having an issue where the phone will often stop audible alerts, and give vibration only on band only. That is just the missed call notification. Since the last version I have many false periods of sleep (mi-band 1S). Am I alone? Yes, same for me, and also when I have an "activity" without moving a lot, just like watching tv for example (no, I'm not sleeping in front of TV). I never have this before. But, there's one problem. 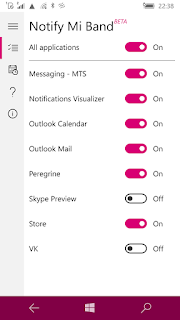 I need "Notify Mi Band" support for Windows Phone 8.1 or Windows Phone 10 before Anniversary Update. I have Nokia Lumia 1020 and stuck in Windows 10 version 10586.494. I don't want to update to Anniversary Update version because I still have original apps made by Nokia like "Nokia Pro Cam, Nokia Cinemagraph, Nokia Panorama, Here Maps, Here Drive, Here Transit, etc". I tried update to latest version (Windows 10 v10586.682), and suddenly all my Nokia apps updated to Microsoft version (all apps made by Nokia updated to become Microsoft version and Microsoft just make it worst!!!) and can't be opened. And I have to rollback to Windows 10 version 10586.494 to get my Nokia apps. So Ian, can you made "Notify Mi Band" Support Windows Phone 8.1 or Windows Phone 10 before Anniversary Update? If you can make it, I'm so happy. It is impossible because Microsoft gave necessary APIs to developers only in the Anniversary update. I don't really like W10M too and I prefer to see Denim on my Lumia 830. But Microsoft gave us some interesting features in the AU. Hi and thanks for a great job! No release info for "Notify Mi Band" 1.2.1.0 ? Hello, i want to ask, why i can't download this apps on store? It always give me error, see detail, but when i click it, it redownload again and stuck again. Other apps download and update work well. Xiaomi Mi Band 2 firmware was updated yesterday to v1.0.1.21. I get 0x80240024 error when installing notify mi band, can you please help me? Can this app be optimized to work on Windows Phone 8.1 in the future? You can upgrade to Windows 10 Mobile (even install latest redstone build) after some registry tweaking. This app can't work on Windows Phone 8.x, because WP8 lacks Notifications API. Any progress on firmware update? I bought licenses for two phones and two mi band 2. I'm waiting for this because on both heart rate monitor does not work anymore. Yeah, but there is problem with unpair from W10. In Bt settings is delete, but I cant connect it to other device: "still taped to win"
Do you have manual for safety unpair? No need to unpair. Just turn off Bluetooth on your phone, pair the device with the IOS or Android device (directly in the bluetooth settings) than go to the app and select the possibility to add a device. when i pair Mi Band 2 to android phone, i just turn off BT on my Lumia, switch on BT on android phone and run Mi Fit app. select add device and when band start vibrate press button on Mi Band 2. Yeah. Its problem with unpair on win 10. After delete in Bt settings, there is still possibiluty to pair it again only with "tap". So its not unpaired, its just delete from Bt settings. I dont know how to unpair correctly.. Mi band allowing only one device paired at the same time. maybe your Band have some problems??? i dont need to unpair... just turned off BT on phone and can pair with android without problem. just idea: did you maybe have other BT devices in range? or DECT phone??? I was reading about this topic. And there is only one MI ACCOUNT touched to mi band. So if I theoretically change device and login with same acc, that should work. So my question is: What acc is joined with Bind mi band? There is no registration or something. Do you have idea? Yeah, that was just idea :). Guys!!! Is it possible, to do this for windows 8?Win 10 is not so good :/ And I will really need this. Thanks your work, and maybe your ansver. you have problem with older firmware on Mi Band and you need android device to update firmware. Hi, in recent Miband 2 firmware there is a function that automatically turns off "lift to show information" when DnD mode is on. This works great with option, that turns DnD automatically while sleeping. It would be great to use both functions on Windows too! Any chance we'll be able to update firmware from Windows App? Not necessarily now, maybe in the future. Just to know if I should hold my breath or move along and use some android crap to update. I don't know if it is possible (does it exist on 3rd-party Android apps?) but I would also love it! The app would just be perfect with it (and with the possibility to update the firmware). It will be possible to update firmware of Mi Band 2 in upcoming update. Hopefully, it's coming out next week. So, hold on, guys! Great! What about the possibility to have a different image for each type of notificaton? (I don't know if the firmware supports it). Wow! After few months I will be able to use heart rate monitor again. I can't wait for this. Is it possible to add a 'reset mi band 2' to the app? My heart rate monitor suddenly stopped working. Same here, worked for two days and then stopped working. A reset could be fine! Latest firmware version is 1.0.1.21? The problem with HR exist since version 1.0.0.53 and isn't solved since then (source google). Do you have info what I haven't/couldn't found? Or? Mine worked good for 7 weeks with version 1.0.0.53 and 3 days ago HR stopped working. On the internet are many simular cases. The mi band 2 works well and than suddenly HR crashes. (without any firmware changes!) Firmware updates don't solve the problem. So enjoy your HR when it's still working. Tomorrow can be totally different:-). Feature suggestion: how about a desktop companion app that reads from the OneDrive backup data and shows in the form of a dashboard the data recorded via the phone app? Hi app is very good. But I have problem with sounds of my outlook in phone. When is notify enabled app not play sounds of new mails. Could you add different icon for each notification on band ? And it shows the error information with problem in network when I try to buy the pro.Thanks for this app! notification phone call in " dual sim phone" = no work in win10mobile ! Hye..what is the status foe this apps..can it notify call and whatsapp?